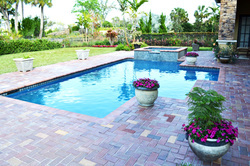 A great way to update your home is to renovate or add on to your existing pool. There are many renovation options for residential and commercial pools.Acid washing, resurfacing, fire features, water features, new tile, coping, and decking can all help make an outdated pool look like new. There are also many options for pool additions. Depending on the current structural condition of your pool, it often can be added on to. Additions include spas, sun benches, beach entries, fountains, and pool extensions.